Prior to going down to Melbourne I asked on the Sydney Spoolettes Facebook group for recommendations on fabric shops to visit in Melbourne. I know many of our members have been down there and word of mouth is always the best recommendation. I was able to get a good list of shops to visit plus I had a couple in mind already that I knew of. My fabric crawl took place over 2 days. Day 1 was just a mini fabric crawl as in the morning I had done a couple of other Melbourne touristy things. The first place I visited was Tessuti fabrics. Tessuti has a couple of shops in Sydney but I have only ever been to the Surry Hills shop. I thought it might be fun to visit the store in another city, I mean how often am I going to get a chance to do things like that. 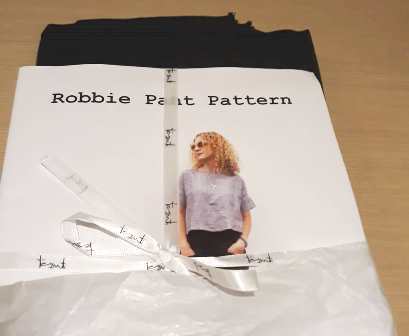 I got 2 items there (apologies for the bad photo but I took it in my hotel room on my phone) A friend of mine has made the Robbie Pant pattern a few times and looks great in them so I decided I wanted the pattern to try it myself so that was on my shopping list. I also got some linen like fabric to make them in. The fabric looks black in this photo but it is actually a navy colour. The second place I visited was Luccello. I would describe this shop as more like a quilting shop as most of their fabrics are quilting type fabrics but they do have lot of trims and buttons and other bits and pieces that aren’t necessarily directly quilting related. It is a very nice little shop and worth the visit. It is only about 5 mins from Tessuti as you walk down to the main train station. From there I purchased some quilting cotton again to make the Robbie Pants in. 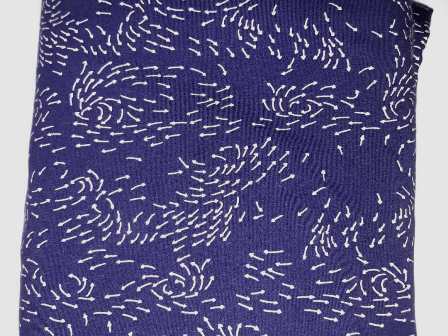 The print is a bit quirky, it is very geometric which is something I’m drawn to. Of course it is blue, everything is always blue. This fabric should make nice pants hopefully. Day 2 was my big fabric crawl. It was my last day in Melbourne and I dedicated the entire day to it. Over breakfast I sat down and wrote a list of 4 shops I wanted to visit. I looked up public transport options and discovered the first 2 shops which are next door to each other I could get a tram to the rest I would have to catch taxis between. When I was at my first stop I was given the name of another shop to visit so I ended up with 5 shops to visit that day. The way I shop for fabrics and most things actually is I walk around and look for things that jump out at me. I am fussy about what fabric content so sometimes I will see something that catches my eye then I walk up and touch it and think no. Walking around The Fabric Store 2 pieces jumped out at me. 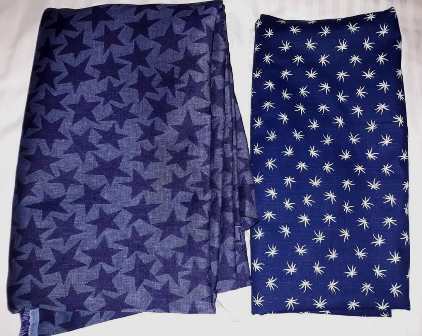 A navy and white palm fond print and some denim like blue star fabric. I love stars, blue stars are even better. The star fabric I’m hoping again to make Robbie Pants (I really hope I like this pattern) I’m thinking they will be like jeans but with a pull on elastic waist. The palm fabric I decided will be my new handbag, my current bag is falling to pieces so I need to make a new one. 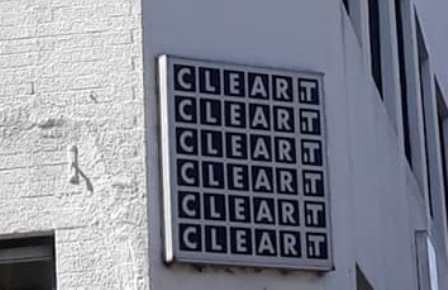 Stop 2 – Clear It. This is like a hidden gem that unless you knew about it you would not think to go there. It is part of an outlet shop for Alannah Hill and a few other brands. The fabric section is located on the upstairs section of the store. 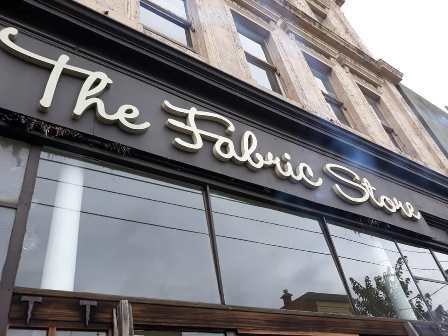 There are signs on the front of the shop that says it sells fabric but unless you were actually going to the shop you wouldn’t know to go there for fabric. The fabric section isn’t very large in terms of space but it is in terms of quantity of stock. There are rolls and rolls on fabrics on about half a dozen shelves that go from the floor to almost the ceiling. There is also a table full of buttons, trims and other small accessories. All the fabric is really cheap between $4 – $10/m I think there may have been some that were more expensive but mostly it was within the price range. You could even buy a bolt of fabric. The fabrics ranged from synthetics to cottons to wool felt to suiting. A real mixture of fabrics. I actually strayed away from blue fabrics! 3 fabrics jumped out at me. 2 cotton prints and a synthetic knit. The knit I am going to make a halloween skirt. Normally I don’t make clothing to wear only for like one occasion a year but this fabric was $4/m and I need 1m to make a skirt so for that price I could justify getting it. 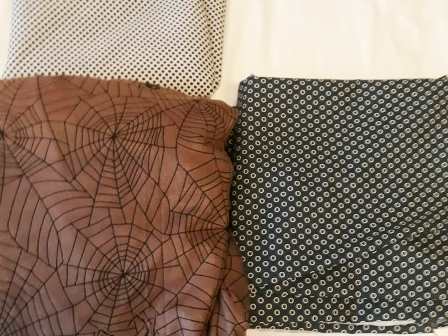 It is hard to tell in this photo but the darker fabric is a mottled green colour with white circles and the lighter fabric is simple black spots. Not sure what I am going to make with these, I got a couple of metres of each. From memory the darker fabric is a little bit heavier so I think maybe a skirt or even shorts. The lighter fabric my guess will be a top. Stop 3 – Rathdowne Fabrics. 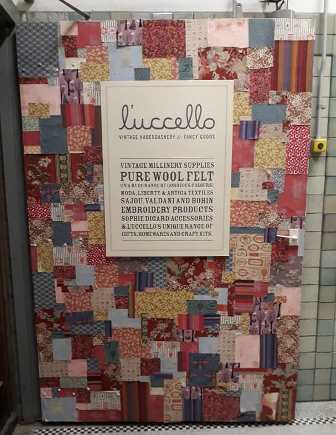 This shop has a range of fabrics – cottons, wools, synthetics, quilting cottons, knits, fleece, upholstery pretty much everything you are looking for. They have a lot of remnants which are pretty organised by from memory colour but possibly also fabric composition. The remnants were fun to look through and were located around the store in different areas. From one of the remnant bins which I think was full of blue knits I picked up 2 nylon knits to use a laundry bags. Each one was about 1m in size and were $4 each. The fabric is almost the exact same fabric I made my laundry bags from with fabric I got at Lincraft, The only difference is that they didn’t have a motive on them like my other fabric, colour wise and fabric wise they are exactly the same. 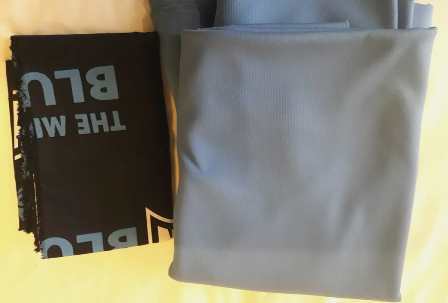 I have actually made up one of the remnants into 2 laundry bags already, I got one smaller bag and one medium size bag from the piece. 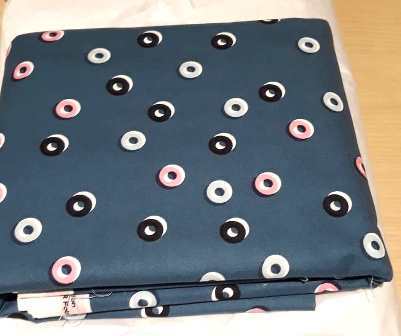 The second fabric I got is a cotton, it is kind of like a secret cotton so I can’t really say much about it except I was that I was on the lookout for something like this so super happy that I stumbled across it. I brought 1m so will have enough to make what I have in mind for it. Stop 4 – GJs Discount Fabrics. I knew that the owners of the Remnant Warehouse in Sydney had a sibling connection to a store in Melbourne but I didn’t know which shop until I walked into GJs. The layout and fabrics were very similar to the Remnant Warehouse. This store is out in the suburbs and I don’t know how easy it would be to get to by public transport. It is in an industrial area so you really need a car to get out to it or in my case a taxi. On the way out there I’d got chatting to the driver saying I was wanting to visit different fabric stores but I didn’t know the layout of the Melbourne suburbs so perhaps my planning on the order I went to the different shops wasn’t the best. I was super lucky that the taxi driver offered to turn off the meter and wait in the carpark whilst I did my shopping, his father was tailor and his wife made things for their home so he was actually interested in fabrics. When I got back in the cab he even asked if he could see the fabric I purchased. Because the shop was similar to the Sydney shop I didn’t get overwhelmed when I first walked in even though there was bins full of fabrics in the entrance way then rolls of fabrics when you walk in. I knew what fabric compositions I liked or what I was interested in purchasing and what to just walk past (dance wear, synthetics, quilting cottons) The one fabric that jumped out at me was a cotton lycra knit by the designer Art Gallery. I have been wanting to get an Art Gallery knit for a long time but never found one I liked or in my price range. I think I got 2 metres, I’m not sure what I am going to do with it yet. I could easily see a Turner skirt from this but you never know. I’m just excited I got an Art Gallery knit. Stop 5 – Darn Cheap Fabrics. This was the last stop on my fabric crawl and the shop I spent the most time in, not because it was the last shop but more because it had fabrics that I was interested in. It had more of the fabrics that I wear in it, lots of cotton wovens, cotton knits, organic cottons. They have other fabrics as well (wools, synthetics, silks etc) The layout was well organised and easy to get around. They also had trims and notions and accessories. This was the shop that I also purchased the most from, as I mentioned it had my kinds of fabrics in it at really good prices. I got some paisley denim which will become a York Pinafore, this will be a more relaxed casual type one that I can throw on with sneakers. It isn’t a heavy denim so should work out nicely. I was looking for some lining to use in my new handbag and came across a white quilting cotton with navy rain drops. The joke is that I am a Princess when it comes to rain (I hate walking in it, I hate getting wet) I always carry an umbrella if there is even just a hint of a chance of rain and if I feel a few drops of rain up goes the brolly. I have a range of umbrellas in different sizes for dependent on how heavy the rain is (they are all in the one print design too) I love the irony my handbag will have raindrops on the inside of it but it does closely match the colours of palm fond fabric. The light blue fabric is a sheer cotton, the geometric shapes jumped out at me straight away. It is way too sheer to wear by itself so I got some navy organic cotton to put with it in a lined skirt, together they should work well. 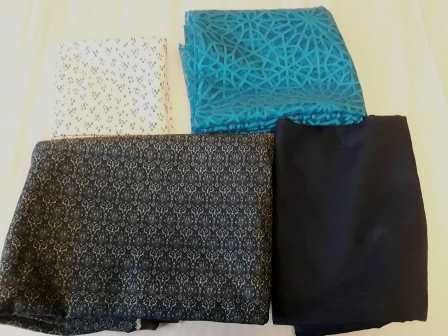 I do have a skirt pattern in mind which I have previously made so I am going to try that again with these fabrics. My fabric crawl was so much fun. Going to new shops, touching all the fabrics, thinking what I could make. Do I have a fabric shop? 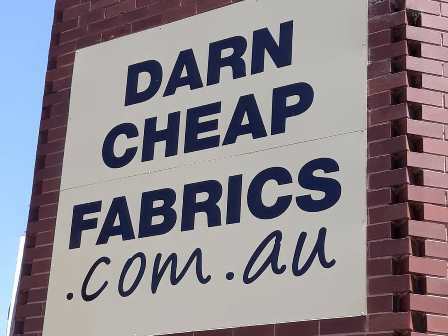 If I was to go back to Melbourne and only had a limited time to shop I would revisit Darn Cheap and Clear It again. All the shops were worth the visit but those too in particular stand out for me in terms of price and the types of fabrics that I am interested in. If I went to Clear It I would probably then also squeeze in Rathdowne as it was only 10mins or so from Clear It. Oh I should also point out I did actually do the one thing I went to Melbourne for and that was ride my tram. I did that after I visited the fabrics shops on day 1 of my fabric crawl. Just outside Flinders St station (which is down the road from the 2 fabric shops) you can catch the City Circle tram which is a free tram and it is the older style trams just like I used to see pictures of when I was a kid. 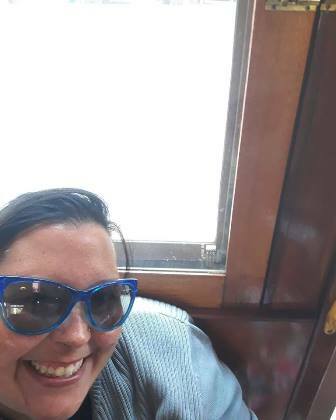 As you can see from the photo I loved riding my tram. The features inside were pretty, the outside was gorgeous. On the plane home I just came in under my baggage limit by 1kg so I didn’t have to pay excess baggage. Maybe 1 more ball of yarn and couple of pieces of fabric would’ve tipped me over my limit. I’m really glad I took the large suitcase. I enjoyed my Melbourne holiday now to get in and start making things with all the lovely yarn and fabrics I purchased.